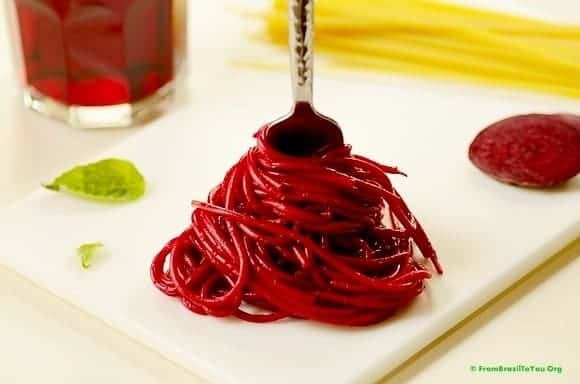 How to color pasta with juice is something I have been learning about recently, and I would love to share this easy secret with you. So yes, from now on you won’t have to pay extra for stored-bought colored pasta… or even spend time making your own pasta from scratch with special colorings. Simply obtain any regular dry pasta you prefer from the supermarket and color it yourself using vegetable juice. This is an ingenious technique similar to that of boiling pasta in wine. You can use beets, red cabbage, spinach or any other leaf vegetable, bell peppers, etc. The most important thing is to use sufficiently concentrated vegetable juice. 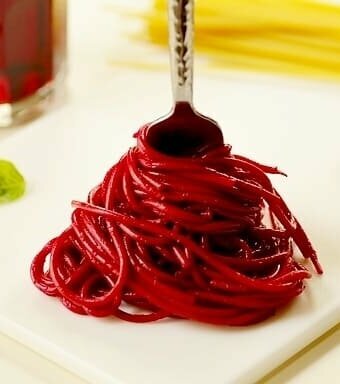 Coloring pasta with juice is a technique that not only infuses subtle flavors but also makes the dish more beautiful and fun. Ready to get started? 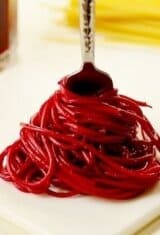 Learn how to color pasta with juice and save both time and big bucks... and also make your pasta dish more beautiful and fun! First, make the beet juice. Blend beet chunks and 1½ quarts of water in a blender until smooth. Strain juice and discard beet pulp. Reserve the beet liquid/juice. In a medium to large pot, bring the remaining 3 quarts of water and 1 Tablespoon of salt to a boil. Add pasta and cook for about 2-3 minutes or until bendable. At the same time pasta is cooking, bring 4 cups (or 1 quart) of the reserved beet juice, a sprinkle of salt, and vinegar to a boil over medium high heat in a large sauté pan. Using tongs or a pasta strainer, lift out partially cooked pasta from the pot and place in the sauté pan with the boiling juice. Cook pasta until al dente, stirring frequently, over medium-high heat. 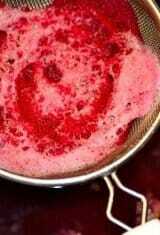 You may need to add another cup or two (or 1/4 to 1/2 quart) of the remaining beet juice to finish cooking the pasta. Once pasta is cooked, strain. You can sauté colored, strained pasta with oil and/or butter, garlic, herbs, cheese, and pretty much anything else that you want. You can use red cabbage, spinach or any other leaf vegetable, bell pepper, carrots (although color won't be vibrant. Definitely, not a fave ingredient to color pasta), etc to color pasta. The most important thing is to use a concentrated vegetable juice to achieve a vibrant color. Very cool! I had no idea you could do this. What a fun presentation for a dinner party! Such a vibrant and exciting way to have a pretty pasta! Thank you for sharing, we do love red beets. do you do this with other vegetables? would it be the same way!? Dioneia: I tested with both red beets and carrots. As you can see in the pictures, it worked very well with red beets — as works well with red wine. But I have to say that the experiment with carrot juice was disappointing. It did not turn a vibrant orange color, no matter how concentrated was my carrot juice. I think it will also work well with basil juice for a green color and red cabbage juice for a dark red. You can also test a small amount of pasta with concentrated green bell pepper juice but I am not very sure if the color would be a light or dark green. Fantastic tip! What a grand idea to make pasta dish special. This is one of those great ideas-why didn’t I think of it before things! What a fun idea! So clever — didn’t know you could do this. Really like this — thanks so much. Do you think if I cooked the beets first that I could then make something with the pulp later (or afterwards if they’re raw)? Beets are a Family favorite (I grow them in my garden) and I’d hate to waste any. Love the vibrancy of the colors and your pictures are beautiful. Visiting from this weeks Tasty Tastebugs Linky at Peek N 2 Paradise. Hi, Sarah! Thanks for stopping by. In order to color pasta, the vegetable has to be raw otherwise color of the pasta will be faded. 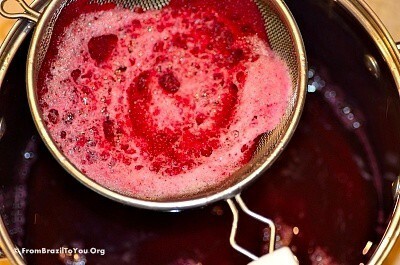 What you can do is make the juice with the raw beets and strain. All the juice will be used to boil pasta and the shredded pulp that rests in the strainer can be boiled in a separate water or steamed to be used in salads or other dishes. If you don’t want to cook the pulp, you can put it to dry instead and use it as a condiment for sautéed rice and other dishes. Denise, this is brilliant! I love the vibrant color from using beets—I must try this, too! 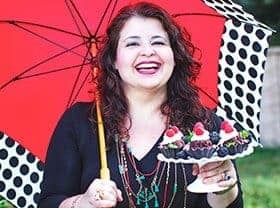 This is such a great idea Denise…not only beautiful colors but flavors as well…great post! Interesting idea, like it as it gives fun to the pasta, and doing it with vegtables is great. So we just neeed to add some olive oil and parmesan cheese and we can have a great meal!!! 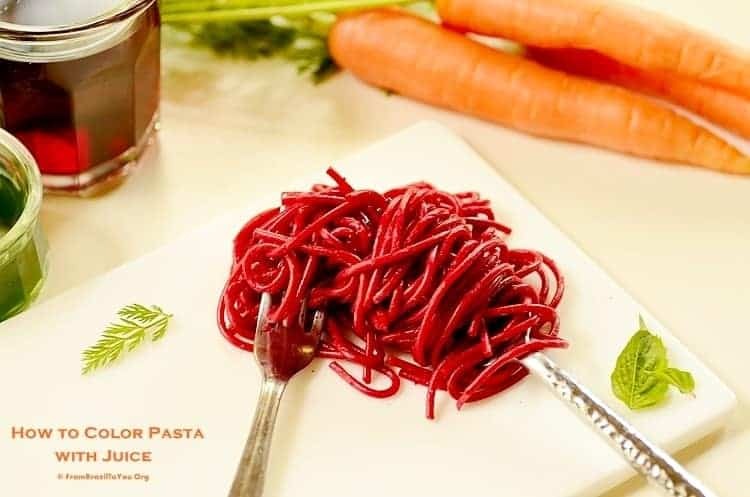 I adore your use of beets to color this pasta – such a gorgeous color! Wow, what a lovely, handy tip we got from you here, Denise! There’s so much colours and flavours to play with in the vegetable world. Thanks for sharing!! Wow! This is just brilliant Denise! A great way to make meals colorful and healthy at the same time. 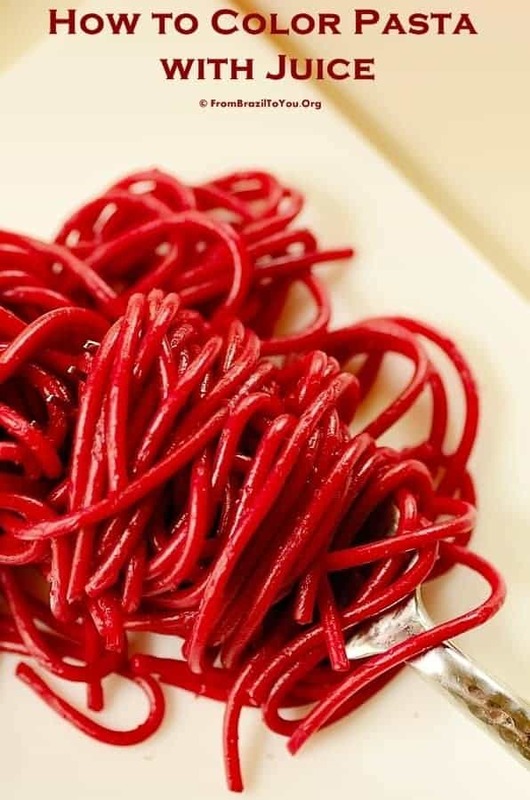 I am crazy about beetroot and this pasta is going to made in my house soon. I love love working with beets and such a nice trick to enhance the pasta Denise. I truly believe in natural coloring and this is gorgeous my dear. Denise, this is truly a fantastic tecnique that I never thought of before! Absolutely creative! Excuse me, I mean technique.